Click link above for important 8th grade activities dates for eligible 8th graders. For middle school starting 3/6/19. Click links above for all details. 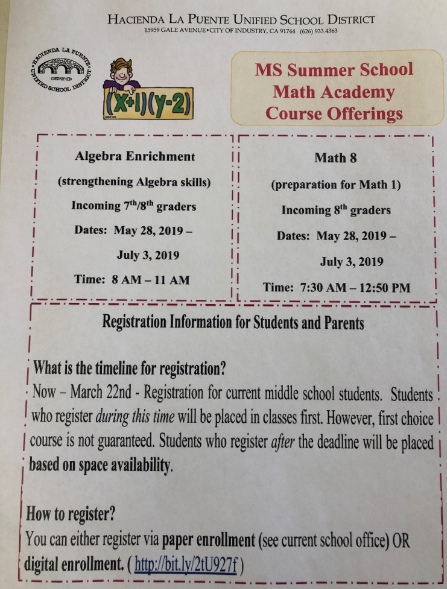 For elementary school starting 3/7/19. Click links above for details. Click links above for more details. Interested in Being a Mesa Volunteer? Click here to visit the feeder high school for Mesa Robles students. Mesa Robles School is an exciting, unique, vibrant K–8 school nestled in the hills of Hacienda Heights, a suburban area of Los Angeles County. With students ranging from kindergarten to eighth grade, over 1,100 pupils arrive each day to pursue knowledge, socialize, and grow. Our mission is to provide all students a positive learning environment with high expectations to reach academic goals and build character with an emphasis on respect, responsibility, and safety.